We accept cancellation for a groups only by E-mail(not by phone)2 weeks before your arrival. Absolutely after 2 p.m. and untill 11.00 p.m. (not in the morning !!!). Winner Most Improved Hostel Worldwide 2014! Ostello Tramonti is situated in Biassa – an beautiful, ancient town, set in the lush green hills that surround the Gulf of Poets (Golfo dei Poeti). Biassa is the gateway to the breathtaking coastline of Cinque Terre and to the many stunning hiking trails that cross the hillside. Cinque Terre is accessible from the hostel by foot or we offer a shuttle service. The hostel is also very close to the city of La Spezia (5-10 minutes) and to Portovenere (5-10 minutes). 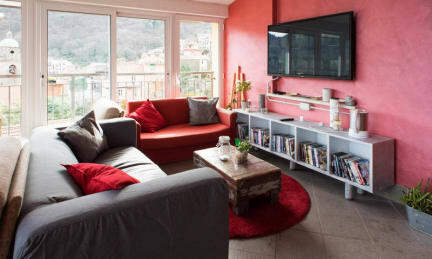 Newly renovated, Ostello Tramonti is the cheapest accommodation in an expensive area and was the highest rated hostel in Cinque Terre on HostelWorld last year! We opened to guests in April 2002 and have since hosted thousands of visitors from all around the world. We have 14 rooms with 4 beds in each as well as one double room – a total of 58 beds. Both floors have bathroom and shower facilities. All parts of our hostel are accessible by wheelchair, including our bathroom and shower facilities. Ostello Tramonti is well suited to individuals traveling solo, small groups and large groups. For people that have their own form of transport, there is free public parking available next to the hostel. Ostello Tramonti has a restaurant and bar on site where delicious meals are prepared from scratch by our Italian chef for very reasonable prices. The property boasts a large terrace and garden area, as well as a lounge room with books to read, TV and DVDs available to watch and board games to play. We have ample space outdoors in our well-kept gardens, with tables, chairs and sun lounges so that you can relax outside. Free WiFi is accessible throughout the hostel and we have computers available for guests to use that are connected to the Internet. There is also a washing machine available to guests for a small fee. Our multi-lingual receptionists will be happy to answer any questions you may have as well as give you information on the hiking paths, sightseeing, activities you can do in the area and getting around Cinque Terre. We have will even give you access to our suggested itineraries when you arrive for check-in! We offer an efficient shuttle service from the hostel to Riomaggiore - the first village of Cinque Terre. From the shuttle, you can admire the first part of the coastline - with spectacular views from the road. The journey takes about 8 minutes and costs only 1€, one way. For guests that stay 3 nights or more, we offer the shuttle service, FREE of charge! The shuttle bus runs numerous times from the hostel to Riomaggiore in the mornings and from Riomaggiore to the hostel in the evenings. The Ostello Tramonti shuttle can be booked in reception or by email, should you need one for your arrival. Between the 14th of March and the 1st of November, there is also a public bus service from the hostel to Riomaggiore. From the hostel, you can hike to Riomaggiore and to Portovenere (a gorgeous town by the sea) with stunning views along the way. A touristic tax (payable throughout Italy) of 2.50€ per person, per night applies but we will pay for you from the third night of your stay! Please remember the city tax and shuttles MUST be paid during check-in in CASH – we cannot charge these to a card. Please do not book this hostel if you plan on catching an early train (before 7:15 am) as there is no public transport or taxis at this time of the morning and taxis cannot be booked the night before. VERY IMPORTANT: Please do not arrive at the hostel to check in or to drop your bags off before 2pm! Facilities in the hostel will be closed for cleaning during this time and restaurants and shops in the town are closed and there are no public buses in the middle of the day. If you arrive in the area before 2pm, we recommend leaving your bags in one of the secure luggage stores at either La Spezia Train Station (Platform 1) or opposite the train station in Riomaggiore. This means that you can enjoy some time in Cinque Terre or La Spezia first and then catch either of the public services to the hostel later in the afternoon or contact us to book a shuttle from Riomaggiore in the evening. We want to ensure you enjoy your time here and make the most of it. As there are no public buses leaving Biassa until late in the afternoon, you will not have a way of leaving once you are here and everything in the town is closed during this time! If you arrive in La Spezia and wish to head to Cinque Terre, you can catch a train from La Spezia to Riomaggiore and leave your bags there, just opposite the train station. It is only one stop by train and about an 8 minute journey. From there you can arrive at the hostel easily, later in the day. This is not a party hostel - for the comfort of our guests, we have a curfew and ask for silence after midnight. Please do not book this hostel if you are planning on catching an early train from La Spezia or Riomaggiore (before 7:15 am) as there is no public transport at this time of the day. Taxis cannot be booked the night before and are not available at this time of the morning. Awesome hostel, with really friendly staff. The restaurant/cafe in the hostel had really good food and was very cheap! The shuttle bus that takes you to the towns in the mornings and picks you up in the evenings is perfect! Everything was great. The staff were friendly and the bistro service was grand. I can’t wait to go back! Really amazing hostel. The shuttle service is really convenient and frequent- honestly staying in Cinque Terre is not necessary because sending the day there is enough and this hostel is in a really cute town in the mountains. Staff are all SO helpful and friendly- they really could not do enough for us! Also great atmosphere in common areas and so easy to meet people. Would definitely recommend staying here minimum 2 nights, I didn’t want to leave!! Excellent time here. Staff are very friendly and accommodating, especially Damiano & Andrea. who went above and beyond to help me personally on several occasions. They described the area well and made great recommendations to get the most out of your visit to Cinque Terre. I highly recommend! One of the best hostel experiences I've had in years. Ostello Tramonti is not your typical hostel as it's a bit of a trek to get to but for savvy travelers who have read through their website it's well worth the visit. I was greeted with a warm welcome and was impressed by everything from the view to the in depth knowledge the staff had of the surrounding area. Had an epic day hiking the trails thanks to the staff being so helpful. Would definitely stay here again!! Great hostel for hiking Cinque Terre. Met great friends here. Shuttle service brings you to and from village. Had a great time. I had a great time here. The little town of Biassa is so cute and just a short bus ride from La Spezia and Riomaggiore. The food at the restaurant in the hostel was good. The staff was nice. Definitely a safe place to stay. I would definitely come back.